Outlook Google Sync is an essential process required by most of us who use both Microsoft Outlook and Gmail as our email application. 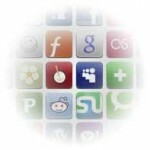 Each of these services maintains its own Contacts or address book. You may have different contacts exists in any of them? How do you synchronize these Outlook and Gmail address books so that when you add an a new contact to one of the address book , it gets updated in the other one? There are few tools or add-in available for Microsoft Outlook to synchronize the address book with Gmail Contacts. 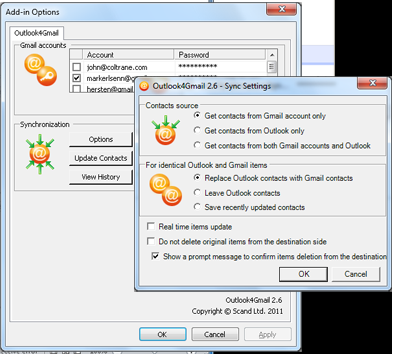 Let us get introduced to few such plugins or Outlook add-in available for Microsoft Outook to synchronise the contacts. Outlook4Gmail is a free Outlook add-in providing easy contacts synchronization of your Outlook and Gmail accounts and address books. One interesting feature of Outlook4Gmail is that it allows synchronizing an unlimited number of Google accounts. In Outlook4Gmail you can define the direction of synchronization. In one-way synchronization you can update either the Outlook or the Gmail address book. In two-way synchronization you can choose to update both accounts simultaneously. In Outlook4Gmail the synchronization process depends on “Full Name” key field and if this is not available the fields “Email1Address” in Outlook and “PrimaryEmail” in Gmail will be checked for correspondence. User can define the rule for conflicts resolution. 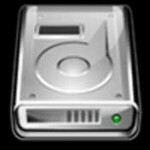 10MB of free disc space at system drive. 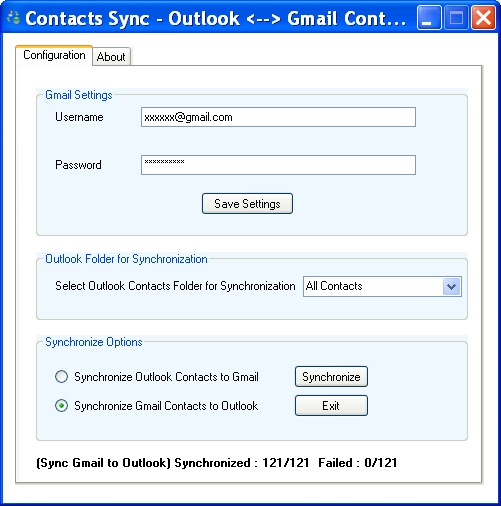 GO Contact Sync is a another free tool that synchronizes your contacts between Microsoft Outlook and Google Mail. GO Contact Sync provides different options to sync, Merge Prompt, Merge Outlook Wins, Merge Google Wins, Outlook to Google and Google to Outlook. If you have enabled merge prompt then GO Contact Sync will ask to you to chose the option in case of a conflict. Contacts Sync is another tool to synchronize your Gmail and Outlook address books. 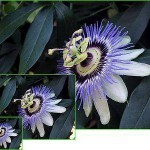 Contacts Sync works with any Gmail account as well as Google Apps account. This tool works in both ways , Synchronize from Outlook contacts to Gmail contacts or you can Sync contacts from Gmail to Outlook contacts.